Although the importance of context has been emphasized by temperament researchers, until now there has been remarkably little systematic research on the unique role specific aspects of context play in the development and impact of temperament. 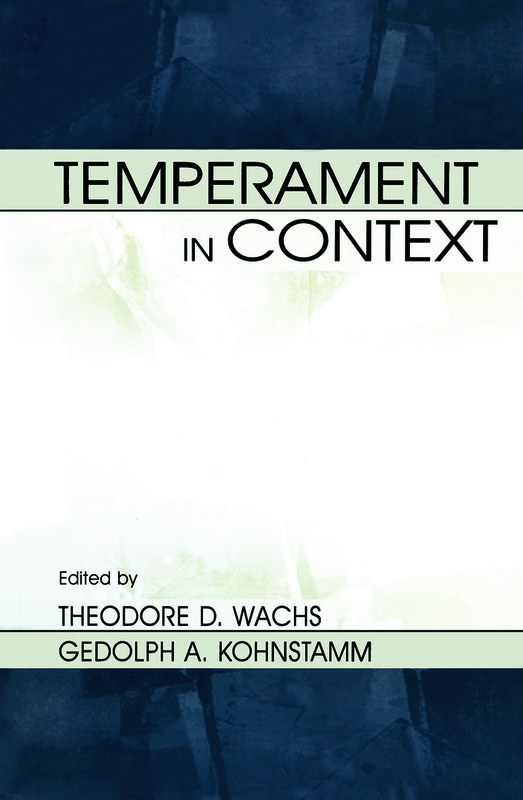 The goal of this volume is to systematize current knowledge and theory on the role played by specific aspects of context in the etiology, expression, and influence of temperament, particularly for those aspects of temperament that are most likely to relate to later personality traits. 1) How does context moderate the expression, continuity, or consequences of individual differences in introversion-extraversion, sociability, emotionality, and inhibition (the I-ESEI family of traits)? 2) How do individual differences in the I-ESEI family of traits moderate the nature of characteristics of the individual's context? By bringing together outstanding international researchers who present their current research and theories, the editors systematize research contributions in the domain of contextual contributions to the I-ESIA family of traits and set the agenda for future research directions. Appropriate for use by scholars and practitioners in developmental science and family studies. Contents: T.D. Wachs, G.A. Kohnstamm, Introduction. P.T. Costa, Jr., R.R. McCrae, A Theoretical Context for Adult Temperament. D. Ramsay, M. Lewis, Temperament, Stress, and Soothing. D. Arcus, Inhibited and Uninhibited Children: Biology in the Social Context. C.F. Halverson, J.E. Deal, Temperamental Change, Parenting, and the Family Context. A.P. Matheny Jr., K. Phillips, Temperament and Context: Correlates of Home Environment With Temperament Continuity and Change, Newborn to 30 Months. H.H. Goldsmith, N. Aksan, M. Essex, N.A. Smider, D.L. Vandell, Temperament and Socioemotional Adjustment to Kindergarten: A Multi-Informant Perspective. M. Kerr, Culture as a Context for Temperament: Suggestions From the Life Courses of Shy Swedes and Americans. J. Strelau, The Role of Temperament as a Moderator of Stress. J.E. Bates, Adjustment Style in Childhood as a Product of Parenting and Temperament. T.D. Wachs, G.A. Kohnstamm, The Bidirectional Nature of Temperament-Context Links.